The playground your kids play on, the rolling lawn college students lounge on and the golf course where you hit your first birdie all have one thing in common. They were all designed and planned by landscape architects. If you want to combine a passion for outdoor spaces with design, this might be the career for you. Landscape architects work to merge function and beauty in outdoor spaces. They often work as part of a team with city planners, building architects, engineers and clients to plan and design spaces such as highways, shopping centers, parks and subdivisions. Landscape architects might also work to protect and preserve natural environments such as wetlands and forests through environmental remediation or they may focus their efforts on preserving historical sites. 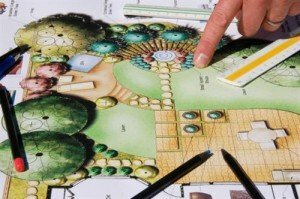 The journey to a career in landscape architecture begins with education. Two undergraduate degrees are available and either a Bachelor of Landscape Architecture (BLA) or a Bachelor of Science in Landscape Architecture (BSLA) will require four years of education. Though not required for licensure, post-graduate study will open more doors and command high salaries. Students who have already earned an undergraduate degree in another field can earn a Master of Landscape Architecture (MLA) in three years. However, those with an undergraduate degree in landscape architecture can expand their horizons and earn a MLA in just two years. Hands-on learning is a key component in any landscape architecture degree. As a student you will work on real projects and learn to use computer-aided design (CAD) to create designs and plans. According to the Bureau of Labor Statistics, all 50 states require landscape architects to be licensed. Requirements for licensure vary from state to state. However, the most important part of the licensure process is passing the Landscape Architect Registration Examination (L.A.R.E. ), which is administered by the Council of Landscape Architecture Boards. While the L.A.R.E and the licensure process may seem daunting, the various education programs in landscape architecture will have prepared you well. The sun seems to be shining on this career. According to the Bureau of Labor Statistics, in 2010 the median salary for landscape architects was just over $62,000. The American Society of Landscape Architects places the figures even higher and suggests that the average annual salary is $78,600 when factoring in bonuses. Between now and the year 2020, the Bureau of Labor Statistics expects to see a 16% growth in this field. This growth will be driven by increased environmental concerns and a larger demand for outdoor spaces that combine form and function. Does a career as a landscape architect sounds close to your dream, but not the perfect match? There are several other career fields that are similar. Architects use many of the same skills and creativity as landscape architects, but focus on buildings rather than outdoor spaces. If you are drawn to the design and planning aspects, but don’t have a passion for the outdoors, this might be an avenue worth checking out. Construction managers coordinate and supervise construction projects. They utilize many of the same project management techniques as landscape architects. If you long for a more hands-on job with less creativity, this might be the path for you.